Disney has announced a new Princess: Merida from Pixar’s Brave. They’ve given her a makeover to celebrate the promotion, and many of her fans believe the company has robbed the character of her very being. Their anger has led to a petition with more than 93,000 signatories. When Pixar and Disney released Brave in 2012, some lauded the effort to make a ‘non-traditional’ Disney princess in Merida. She had wild hair, an independent streak and fought to save herself. She had her own thing going, and to top it off she was fierce with a bow and arrow. She even came with a ‘breaking free of traditional roles’ dress-rip. Oh Pixar. Since the character was quite successful, Disney has decided to change the character’s appearance to make her more palatable to young girls and the Disney Princess line up. They’ve premiered a slimmer, sexier, more glamorous Scot to play the role. 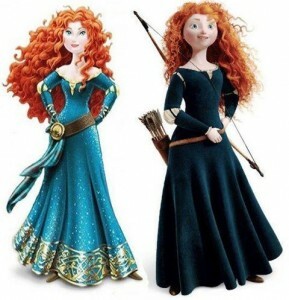 The dress (that Merida disliked in the film) is fancier, the hair less frizzed and the character all around ‘prettier’. Even her quiver of arrows is gone, replaced by a sparkly belt. The change has ostensibly been made to make Merida to fit with the other Princesses, and help lend her design to product designs, but many of Merida’s fans believe the changes run counter to the character and what she represents. Who would have guessed that Disney would violate a creator’s intent to help make money? This entry was posted in Film, News and tagged body image, disney, girls, role models, women. Bookmark the permalink.